Japanese maples are actually pretty tough trees and quite disease resistant. Usually, if a Japanese maple is failing, or doesn’t look good, it’s not from disease but other issues that are pretty easy to correct. First let’s look at the things that you can control. As soon as somebody has a Japanese maple, or any plant for that matter, that doesn’t look good they immediately think it’s being attacked by some dreaded disease. In most cases that’s not the case at all. Contrary to what most people think, Japanese maples are pretty easy to raise and care for. For the most part they are usually care free plants that happily exist in just about any landscape. But there are a few things you should know about them. 1. They don’t like wet feet! In other words only plant them in good rich soil that drains well. If you have heavy clay soil that does not drain well you have to make some adjustments to how your tree is planted, but be careful not to make the wrong adjustments. Many people do it wrong and their tree dies. In heavy clay soil you should only dig the hole half as deep as the root ball on your tree. Then set the tree in the hole and fill around and over the root ball with good, rich topsoil. Keep in mind that the root ball is made up of very loose, porous soil that water can easily drain into. Make sure you do not dig a hole that will become a bathtub that your plant can drown in. That’s why I suggest planting only half the root ball in the ground, then building a raised bed around the part that is sticking out of the ground. When planted high like this your tree will need watered about twice a week, but check the soil near the roots and make sure it’s not soggy before you add more water. 2. They don’t like wet hair! Japanese maples don’t like to have their leaves sprayed with water when the sun is out. The water droplets act as mini magnifying glasses and can leave burnt spots on the leaves. This isn’t a serious problem and not one that I worry a lot about. But given a choice water the roots and not the tops. 3. They don’t like to over eat! Japanese Maples Do Not Like a Lot of Fertilizer! In other words, it’s best not to fertilize them at all. Better to plant them in good rich soil that has a great deal of organic matter, such as composted cow manure worked into the soil before planting. After planting, if you really feel that you need to fertilize use something organic. Pseudomonas syringae is a common bacteria that affects many woody plants, including Japanese Maples. This bacteria is considered opportunistic because it usually attacks plants that have already been damaged by frost or by other means. Japanese maple leaves can be spotted and the veins within the leaves can be blackened. This pathogen can cause die back of small branches. As a collector of Japanese maples for many years I’ve seen little to no evidence of this on any of my plants. Or at least I haven’t noticed. Verticillium Wilt is a disease that can attack Japanese maples. Symptoms are pretty obvious. In some cases the leaves on a single branch will discolor and die, but do not fall from the tree. This often happens in late summer or early fall. In many cases the branch dies completely and should be completely removed from the tree at first sign of the disease. How do you know for sure the branch is dead? This is how you test to see if a plant, or a branch on a plant has died. Just scratch the bark of the plant with your finger nail. If the tissue below the bark is green and firm your plants are fine. If the tissue is brown and mushy that part of the plant is dead. Verticillium Wilt is caused by a soil borne fungi but usually attacks plants that have been stressed by other things. Drought, frost, or wet soil. There’s really nothing you can do to treat your Japanese maples to prevent this disease and there’s nothing you can apply once they have it. It’s something that just happens. Twice I’ve had fairly large branches on my Acer palmatum dissectum maples die back all the way to the trunk of the tree and I have to assume it was caused by Verticillium Wilt. But what’s really important to note is that even though these two trees lost large branches that had to be cut out, leaving a large hole in the tree, within a couple of years the trees filled back in and are once again nicely shaped and beautiful. And they’ve stayed healthy since. Anthracnose is a fungal type disease that attacks a wide variety of tree and shrub species. Affected trees will often have spots or scorch like spots on the leaves. This fungal disease is prevalent during rainy seasons and conditions of high humidity. This disease remains active on the leaves and twigs that have fallen to the ground and eventually spores are released that can re-attach themselves to the tree or new leaves. The easiest method of control is to keep dead twigs and leaves raked up from under your trees. Rainy spring weather tends to perpetuate this disease where hot dry periods can halt the disease. Powdery Mildew is a fungal disease than can attack Japanese maples. I’ve never seen it on any of my Japanese maples, yet I’ve had bad cases of it on some of my dogwood trees. Powdery mildew is easy to detect because it covers the upper side of the leaf with a white powdery film. It thrives in hot, or hot and humid conditions, especially where a lot of plants are grouped together and air circulation is poor. Soft succulent tissue is more susceptible to this disease so avoid summer applications of nitrogen fertilizers. I’ve seen heavy infestation of powdery mildew one season and not the next, so it’s not something that I get all worked up about. Just rake up and dispose of any affected leaves. It’s best not to put the affected leaves in your compost bin. Phytophthora is a condition caused by root systems that are too wet. Plants like Japanese maples and rhododendron are the most susceptible because they are the least likely to tolerate wet heavy soils that do not drain well. This is one of the biggest problems that I see with Japanese maples in the home landscape. Soil that does not drain well, or plants that are planted too deeply in the ground. Even in well drained soil one inch of the root ball should be raised above the existing grade of the bed. In poorly drained soil I suggest at least half of the root ball be raised above the existing grade, then covered with good rich topsoil. Aphids can and have been known to feed on Japanese maples, but in most cases it’s not a big concern. Aphids feed by attaching themselves to the leaves of a plant and sucking nutrients out of the leaves. If there are a number of aphids or if they are there long enough, they can damage the leaves to the point that the leaves curl up and could drop from the plant. However, aphids have a number of natural predators including lady bugs so they usually don’t last long once they appear. You can treat for them with an insecticidal soap or rinse them off with a blast of water. Japanese maple scale seems to be a growing problem, mostly on the east coast. This type of scale insect is known as an armored scale because the insects protect themselves underneath an armored cover that is usually white in color. They are easy to spot on the stems of trees with dark bark. Scale insects are a sucking insect that extract plant sap from the host plant. In plants with heavy infestations premature leaf drop, branch die back, or death of the plant can occur. Scale insects are somewhat predatory and attack unhealthy plants. The healthier your plants, the less likely they are to be attacked by scale insects. If the infestation is not heavy, you can try scrubbing the tree with soapy water and a scrub brush. On Japanese maples, scale insects usually only attach themselves to the stems of the tree and not the leaves, so scrubbing might actually work. Since these insects are under this protective armor they are difficult to control. A systemic insecticide that is applied to the root zone of the plant might work. Check with your local garden professional. Japanese maples can be attacked by borers. These small insects drill into the stem of a tree and if the infestation is severe, serious damage can be done to the tree. Inspect the stem of your tree looking for tiny holes and saw dust. If you find borers you can treat the tree with a systemic insecticide, or there are some borer pastes on the market as well. Some of the old school gardeners heat up a wire and stick it into the hole while the wire is still quite hot. Does this work? I have no idea. My Japanese Maple is about 15 yrs. old and has never had a problem, but this year, I am experiencing severe leaf srying, wilting and leaf drop which started in late July, early August. Is this something that can be corrected? Mine is doing the very same thing, same time…..Please help soon( In a Japanese Maple voice). my japanese maple is withered and drying as well….what gives? Mine is has being doing the same thing! It started in late July with very withered up leaves.. My first thought was it needed water so that’s what I did.. The extra water didn’t help. Now, I have tons of new growth, but all the existing growth has turn brown and is falling… Any info would be great. I am located in Oklahoma. Same here. I’m in North Carolina. I see no evidence of bugs or fungi (yet), and we’ve had first a significant heat wave and a few drenching storms. mine is about 12 years old and just did the same thing! Mine also, and there has been plenty of rain with moderate temperatures. What could it be? I find no answers here at this site. I just answered the brown edges to the person that commented before you, take a peek. My Japanese Maple is about 15 yrs. old and has never had a problem, but this year, I am experiencing severe leaf drying, wilting and leaf drop which has just started. We have had more rain than usual this year. I live in SC. Is this something that can be corrected? It looks like it is dying, but the limbs are still green and not brittle. Sounds like it might be too wet. If it dries out the tree should recover. But if it stays wet too long it could kill the tree. Not sure what you can do though. My maple has these same problems w/the leaf losing color but staying on branch. We’ve had lots of rain! Japanese maples hate wet feet, that’s for sure. Also they need sun to maintain good leaf color. And then variety matters. Some look nice in the spring but lose color in the summer. There’s not a lot you can do. Lots of plants suffered winter damage the last two years. Wait until spring and remove any branches that don’t leaf out. Hi my Japanese maple is doing the same thing. It is 15 years old and looked beautiful till about 2 days ago. The leaves are all curled up and looks dried out. I gave it a good watering but it doesn’t look too good still. First time it has ever looked this way. Any suggestions? If it’s the whole tree it probably dried out. Just water as needed but don’t keep it soaking wet, it might come back. I am having the same experience with our Jap. Maple for past three summers. Edges of leaves are all brown. There is adequate water, no extreme heat, and it’s on the north side where it has been growing beautifully for 15-plus years. What could it be? Brown on the edges means it might have dried out at one point. But many Japanese maples, especially the dissectums, get brown edges in the summer. Unless in a lot of shade it’s going to happen, nothing to be concerned about. I’m in Ohio and my Japanese maple is doing the exact same thing. Mine has isn’t very old maybe around 5 years or so and till 2 days ago it was fine and bam the leaves are all dried and curled up. It has been pretty warm here with little rain lately. I don’t want to loose it. HELP!!!!! I’d have to guess that your Japanese maple just dried out from the heat and a lack of rain. All you can do is water it and wait, but don’t drown it and don’t fertilize it. don’t know much about them and don’t know if this is normal or something is wrong. If anyone can give us any advice please let me know. Thanks in advance! A few brown leaves on the top of the tree after a hot dry summer really isn’t anything to be concerned about, I’d say the tree just went a few too many days without rain/water. Come spring it should be fine, if you have dead twigs on top then, just remove them. This is how you test to see if a plant, or a branch on a plant has died. Just scratch the bark of your plants with your finger nail. If the tissue below the bark is green and firm your plants are fine. If the tissue is brown and mushy that part of the plant is dead. Is it getting enough sun? When the tree is dormant you can try and do some root pruning to stimulate the tree, go around the root zone with a spade and severe some roots while it’s dormant and apply an organic fertilizer like Milorganite. I am glad for writing to let you understand what a fantastic discovery my friend’s child experienced reading yuor web blog. She noticed plenty of pieces, with the inclusion of how it is like to possess an incredible teaching heart to let other individuals completely fully grasp chosen multifaceted subject areas. You actually did more than her desires. Thank you for supplying those powerful, trusted, edifying and even unique thoughts on your topic to Kate. Since the new growth this spring only about a third of the leaves have fully grown, the other is struggling to grow. There are plenty of small fly type insect on them and when you you stand underneath the tree you feel some type of water dropping on you. Help? I’ve found 7 grammar mistakes using http://www.grammarly.cm that I’d like to point out. Only about 1/4 of my Japanese Maple tree leaves have appeared this year. Should I assume those bare branches are dead? This is how you test to see if a plant, or a branch on a plant has died. Just scratch the bark of your plants with your finger nail. If the tissue below the bark is green and firm your plants are fine. If the tissue is brown and mushy that part of the plant is dead. I have a 10 year old Japanese Maple, “Bloodgood”, and the bark is peeling on the large branches, and one large branch has died. Help? Do you know what is causing this? It could be winter damage. I’ve seen really hard freezes blow the bark off Japanese maples. But I’ve only seen it happen here in Ohio one time. My tree was devastated one winter, look terrible for two years, then it bounced back wonderfully. Just trim away the loose bark. Our beautiful Japanese Maple is 4 yrs. old. This spring, just half of the tree has leaves! The other half looks like buds started, but dried up before having a chance to bloom. I really don’t want to lose this tree. My husband wants to cut the “dead” half of the tree off, but when I scratch the branches, there is still some green there, so I’m making him hold off. Can you help? I’d hold off until those branches are no longer green. If they tissue below the bark stays nice and green, it should make new leaves. If it turns brown the branch is dead. Just remove the dead branch and give the tree time to fill back in. Similar problem, but I feel that some creature (s) has been feasting on the leaves. I always accuse the gastropods first, but I now feel that I need to expand the list. I have just discovered multiple spots of missing bark on a maple tree that is over 10 years old. The range in size from about an inch long and wide to spots as big a my hand. They are located on both small and large branches and seem to have occurred recently. I pass this tree multiple times daily but have been out of town for two weeks so they could have occurred while I was away. There are also a few small dead limbs. What is causing this condition and what should I do about it? No leaves if everything else has leafed out is not a good sign. This is how you test to see if a plant, or a branch on a plant has died. Just scratch the bark of your plants with your finger nail. If the tissue below the bark is green and firm your plants are fine. If the tissue is brown and mushy that part of the plant is dead. I did the fingernail test and the branches were an off white color, no green but, hard not mussy. What does this mean. Did the fingernail test. No green or dark color but, an off white color. Hard but, not mussy. What does this mean. My J. Maple is approx. 20 yrs old. Over the past few years the top center has thinned out to the point the heavens are quite visible as opposed to my other 2 which are quite thick. I check’d leaves no evidence of disease/insects, but many high up dead branches that I can’t get to. Water table here was way below average, recent rains have brought levels almost back to normal. I sure don’t won’t to lose this majestic tree, any suggestions Mike or is this a wait n see kinda thing? I was just watering my lovely acer and noticed some odd lesions on the trunk near the ground. Round little circles which are raised up off the bark by powdery white substance underneath them. I am very worried its fungus or parasite. What can I do? Last year I discovered a number of branches of my Japanese red maple covered in what I now assume is powdery mildew. It has occurred again this summer. How do I treat it? If it’s on the branches and not the leaves it sounds more like a scale type insect. Do some research on that. May I send you a photo of my Japanese Maple that is losing its bark? Our Japanese maple has a lot of wasps and yellow jackets on it. No hives on the tree just bees. Any suggestions? My Japanese maple is only 2 years old. It’s had a couple of problems that I have managed to resolve, but since the spring this year, in Glasgow, the plant has deteriorated. Several branches have died and others are still alive and active, but the new shoots are withering as soon as they form. The plant now looks spindly with leaves that look unhealthy. It could be too wet or planted too deep. i have a new japanese red maple planted last yr….the leaves come out, start turning brown then shrivel up. the tops of many branches have turned gray and I have cut many small dead ones off….could it be the staying too wet problem? Most definitely too wet can be a problem. My Japenese Maple has been attacked by spider mites. It was slowly dying with the leaves shrivelling and new growth starting but then dying. Of all the things I thought it might be, this was the last thing! The tiny almost invisable webs were what prompted me to research more. I have sprayed the maple and another ornamental plant that is also infected. I will just have to wait and see if it is indeed to late to save them. Help!! My Japanese Maple tree is 3 years old. This year the leaves came out as usual, however they now are wilted and dry. Is there anything I can do to save the tree? I think our soil is more on the clay side and we have had more rain than usual. Thanks. It could be too wet or planted too deep. You need to find a way to lift it if possible so the roots can breath. Not really. Just remove all of the loose bark and with a knife trim the bark that still secure to the tree so it tapers down to the exposed wood and water can’t get under it. If the tree is still alive you might be amazed by the recovery it can make. It probably is. Wipe it away and try and keep that part of the tree as dry as possible. You can also spray a general fungicide. My little maple leafed out beautifully this year, but several weeks ago it mysteriously started looking like it was dying! The leaves have gotten brown and crunchy, like they are burned, with some strange white puffy cotton under some leaves. The white puffy cotton has little spots in it like eggs. There area also adult insects that look like the tiniest white moth you’ve ever seen. Please please help me rescue my little tree! Any advice is welcome. She is not dead because much of her trunk is still green. She is also trying to bud out a few new leaves. I’d spray the insects and see if that helps. I have a acer palmatum (Japanese maple) that has two large black areas on the trunk. One has begun to dry up. What causes this and how can I treat or do I need to treat? I don’t think I have an answer for you. I have 2 4-year old dwarf Japanese maples which have thrived until this year. They’re fully branched out & leafed, but the leaves are curling & turning orange. I first noticed this in June. My Green Japanese maple has Small spider web Pockets. there are very small butterfly looking insects on the tree also. They are eating the leaves. I would like to know what to spray this with. Any general insecticide should work. My Red Japanese Maple was hurt by a Michigan frost last year but seems to be recovering, however the leaves are turning green. It looks like it needs furtilizer but I have never had to feed it in the past. It has always been the envy of all who saw it. Can you please advise?. If the leaves were red, but turned green later in the summer I’d just leave it alone. If the green leaves are growing from the base of the tree in only certain spots they are suckers and have to be removed all the way back to the stem of the tree. My 15 year old Japanese maple has a some sort of disease or fungus at its base. The bark has opened and there is a liquid running out of the area exposed. The leaves of the tree do not look very healthy this year. Its has the appearance of looking sick and waning. Is there anything I can do to treat it. I did spread a decent amount of compost around it this spring after I noticed the problem. I’d clean up the stem of the tree and trim the bark around the opening so there are no jagged edged or loose bark. You want a smooth transition from the bark to the exposed wood so water does not collect in the wound. Other than that I’m I’d just give it time and hope for the best. I have two Japanese Maple trees in tubs. One is fine but the other ones leaves have curled and shrivelled all over the tree. Do you know what this could be and could this disease transfer to the other healthy one . Thanks. Make sure the roots are not too wet. This does happen sometimes for no apparent reason and I don’t consider it contagious. I have an Acer palmatum with a crusty black growth or residue at the base of the tree. Some of the upper growth is also dying. It is a old tree, not sure of age, but its large for a Japanese Maple. I want to save this beautiful old tree, any help is welcome. About all I cans suggest is that you clean up the tree best you can and see if there is damage to the tree from the mold or what ever it is that is on your tree. Nothing something I’ve ever seen on Japanese maples. Glad to have found your page on this topic: I live in NYC and just moved into an apartment with a large, sunny outdoor space. The first thing I got was a 6 1/2′ tall, very healthy looking Japanese Maple. I planted it in the largest tub I could find–around 2′ deep and about 3′ across. After a glorious summer, suddenly nearly all the leaves started browning, then getting covered with (what I’ve now learned is called) Powdery Mildew. What, would you say is the best, simplest treatment? I’ve seen wildly varying ideas on the web. Have you heard of using Epsom Salts as a treatment (due to the high sulfur content)? Would it be applied topically or to the root system–or both? My tree is in serious distress…and it would really be a drag if it died…and if I told you what I paid for it, you’d understand why! But more than the money, I don’t want to lost this exquisite tree….HELP! And thanks! I have a newly planted crimson Japanese maple that I i absolutely love in need of help! I planted it in the spring this year and it looked great for a couple months but now all the leaves turned white in the middle and the tips shriveled and brown. It is also loosing leaves and it looked very wilted. If it is powdery mildew or a scale how can I help it or cure it. Thank you! my jap maple is 10 years old, since the last 3 years it has less and less leaves, they are smaller, and they tend to be at the tips of the branches. This winter I pruned it by 1/3 and you can see it wants to have strong leave growth now this spring, but the leaves are very tiny, and do not continue to grow. The pH value is slightly acidic, I use organic matter and slow release fertilizer, it is on sand stone, semi shade. I cannot detect an insect, but what I noticed is that the branches have some sort of greyish crust where the leaves are, not sure if this is any insect, or fungus or what? My beautiful tree has pale green spots all over the bark – trunk and branches. It’s winter – no leaves. My japenese maple is over 40 years old! It’s one of the most beautiful trees I’ve seen this size … It’s leAves are all dried n brown . It’s looks like it also has a green fungus like growth that started wen the rain started. I hate to lose it! It’s been very dry here in Cali. Please give me an idea of how to save it! I planted what I believe is a Bloodgood Japanese Maple (has bronzy purple leaves that turn more reddish in fall) approx 8 ft from the corner of my house on a 6″ raised bed. That was 7 years ago and it just thrives there (gets only morning-early afternoon hot Georgia sun, not much wind, good drainage, etc). Problem is I am afraid that the roots will get into my septic (tank is about 12 ft away on a slightly lower level) not to mention my house foundation. Should I try to transplant it? (it is around 8 ft tall as I keep pruning it off every year to try to keep it smaller, hoping this might help control the roots?). My two year old Maple has shoots growing from the ground there are buds and some leaves but the top part is just sticks is it dying or do I just let it grow? I Have a Japanese maple Doesn’t Have But 5 Leaves on it this year its 5 years old Alot of the branches look like they are dead and I have trimed it back some but it is sobare this year.I have hostas under this tree and a couple tulips could that be stopping the growth of leaves? There are a lot of withered leaves on my Japanese Maple. Do I need to leave to wilted leave on my maple or should I just let them naturally drop off? I do see signs of new leaves appearing on the tree. I have a red Japanese maple that is about 15 years old and has always been very healthy. We were out of town from April 1 to May 4 and when we came home we noticed that the maple had absolutely NO leaves on it and could not see any leaves fallen on the ground either. This tree was totally healthy and thriving when we left!! I just now did your test of scraping a branch with my finger nail and the colour beneath is beige but not green. Yikes – am still at a loss. Please help! my maple is losing its bark, but after reading this, I’ll just keep my eye on it. but I will have to check the baby maple I planted up front for drainage. All of my Japanese Maples of different varieties from seedlings to grafted 2 year trees. They were growing fine with beautiful leaves, now all of the sudden all the new growth on all of the trees have deformed leaves. They are not wilting nor turning brown. Still a beautiful red color, still growing bigger but the oddest shapes I’ve ever seen. Looks like something from outer space on the tops and normal red Japanese maples at the start. What in the world happened? HELP! Hi I have had a Japanese maple for over ten years and this summer its had some branches that haven’t got any leaves on…now I notice its got small white cotton wool blobs with a flat object in the middle could you tell me what it is? I don’t know how old my dwarf Japaneese maple is but we had the polar vortex a few times this winter. My tree has lots of leaves but there are large white spots on the leaves that go all the way threw the leaf. At first I mistakenly took it for beetles and spread 7 all over it but the spots are white not holes. My bloodgood Japanese Maple has many of its leaves with many little holes as if it is being eaten by insects, but I find no insects on the plant. We just purchased it about a month ago and maybe I didn’t notice it had this problem until recently. Know what this is? For 20 years we’ve had a Japanese maple in perfect health. For the last two years the tree’s leaves have started curling and burning up in early June. This Spring considerable dead branches had to be cut back. The rest of the tree bloomed out normally, but within a month the leaves did the same thing as last year. New growth is replacing where the dead leaves have fallen off. The tips of those leaves are now going through the same process. Is there any hope for this tree or is it destined to die??? Please help!! leaves were the normal yellow coloration with a bit of a ruddy cast. The tree is approximately 6.5ft and is located in a pottery container-27″wide by 24″ deep. There are 2 1″ drain holes. severely. Can it be saved? I’ll await your reply. I doubt it but I don’t know that I’ve ever noticed anything like that. My 15 yr old Japanese maple always turns it’s bright red color and soon thereafter drops it’s leaves in early November here in NC. Here it is December 9th and almost all the leaves are withered but still on the tree. What has changed? I have a red maple bush with red buds, that has dried up and also have a white glue like substance on the leaves. HELP. My Japanese maple has white spots on the trunck and in the branches. It looks like a fungus. What should l do. It’s a small tree and has been planted for 25 years, without an issue up to date. What causes this to happen? My year-old Japanese Red Maple (Bloodgood) is not leafing out and scapings show tan under bark; some tiny branches easy to break off. We have had significant amounts of rain over the winter and I am concerned that the tree has wet feet. Would there be any benefit to digging around the base to loosen soil and possibly trying to lift tree abit to aid in drying out. Soil in my area of Central Texas tends to be heavy with clay. I did use composted material mixed in soil when initially planting last year. The leaves on My newly planted crimson queen have turned gray. It was hit with pretty cold weather one night but looks like it is getting worse. What could be the cause and will it recover? Help I am sick about it. Have a red lacy-leaf japanese maple about 4 feet tall that is 3 years old. It does well in the spring and early summer but around late June or July, the leaves shrivel and die. Branches aren’t dead except on the tips. I trim the tips off. I transplanted the tree once out of full sun all day long thinking that might be the problem but last year in the new location, it did the same thing. I saw several comments about similar conditions in this blog but didn’t see a definite answer on what causes it or what to do to prevent it. Would appreciate any detailed help for my problem. We have a Japanese Maple in front of our house, facing south. We are in Michigan were spring can come and go in the early months. Some 3 years ago we had a hard freeze in April and all the buds died. It is just coming back and this year we shaped the tree and removed some dead and some real long branches. We noticed the trunk of the tree from ground to top has lost or is loosing its bark. We did not notice any bugs or webs or dust. Is this unusual or has something happened. Is this tree dying? Please help ….. This is my treasure….. My dwarf had matured with my home that I purchased 13 years ago. The center trunk and some other branches have a light green mold that is growing on the bark. The maple looks near death and I thought was due to trauma from my lawn person snapping a large branch off but the fungus continues to grow. I don’t know if it’s temporary or treatable but I do not want to loose the maple. It is not dead. We have had three Japanese maple trees die in the last few years. And we have no idea why. They seem fine in the fall, lose their leaves like normal have buds for the spring but do not come back in the spring, and under the bark there is no green. This year we lost our biggest and oldest one (about 30 years). Any idea what could be causing them to die off – we have another 10 or so smaller ones all about 10 years old. We have a Japanese Maple that we believe is very sick. We are new to caring for maples, but we have basic care down. My husband watered in June of last year and noticed leaf wilt the next day. The leaves never fell off, so he picked them off. In early March we pruned and potted, noticing no sign of distress. Weeks after the pruning the tree began to brown. This is somewhat normal after heavy pruning. It is now May and we fear the tree is dead. There are no signs of leafing and the wood beaneath the base of the trunk is brown. Is he dead? Can we help the tree? 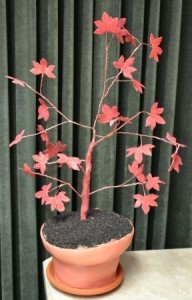 I have a young red japanse maple,but at the top of tree no leaves at all. Bottom of tree looks very bright and healthy. Why doesnt it have leaves on top branches? The clue was wet feet. I carefully lifted maple today and discovered about a gallon of Water and muck under the roots. Cleaned out put in stones and sand then lots of topsoil. Now maple is planted 3/4 above original ground level and dressed off with mulch. Here in NC we have hard pan 8″ below ground. If there is any improvement I will be back and let y’all know soon. Pls forgive me if this question has already been asked as I couldn’t find the answer. I’ve got a jap blood maple going on its second summer here in a hot humid state of TN. Last year it developed brown spots on the leaves and has never left after doing so. What can I do? All of my green Japanese Maples have white, raised “spots”. They are mainly under the leaves but some are visible on top. When you scrape on off, they are soft. Any ideas what this is? It is only on the green varieties. My Acer Palmatum lost all his leaves, they turned brown and fell off. I pruned it back a bit too much. The trunk is brown and there is no new growth. I tried to scratch it to see if there is green beneath but it’s too hard to scratch. My other two Japanese maples have green trunks. Did I kill it by over pruning the dead branches and leaves? Should I replace it or wait and see if it comes back? This occurred in July during a heat wave. My twenty year old Japanese Maple is losing it’s bark just above the soil line. Otherwise it looks healthy. What can I do? There’s not a lot you can do but take a sharp knife and trim the dead bark back to an area where the bark is still attached. This could be left over winter damage. As long as some of the bark remains the tree has a chance. I have a young japanese maple that is only a couple years old and in a well drained bed with partial sun through out the day. It is now fall, and the branches never grew any leaves or showed signs of growth. However, all the new growth (appears to be healthy) came from the bottom or roots and grew in and around the branches of the tree. It does not look how it should. Should I cut back the tree to its roots or the ground? Do you have any suggestions on this problem? It sounds to me like the desired part of your tree died and what you have left is growth coming from the root stock. If it’s attractive just remove the dead wood and let what you have grow into a multi stem tree. If the leaves are not attractive dig up the plant and throw it away. We live in the SF Bay Area. We have a bench of Japanese maple trees in our garden. They all turned red and lost their leaves in November. Except one tree: this one grows partially under a roof and needs manual watering. On this one, the leaves colored brown, and they are still brown right now and on the tree. Is there a thing we should go? Water it when it is not freezing? Or not water it at all? Not much you can do right now. I would suggest not watering. Japanese maples hate wet feet so you have to be really careful to not over water them. I’d just give this tree some time. Come spring it will either be fine or not, nothing you can really do to change that out come. I have a couple of Japanese Maples. One is a weeping tree I purchased a couple of years back. I reported it this Spring. Last year not long into Summer the tips of the leaves browned, then shrivelled and not all fell off. Thought I had killed it. So reported this year into terracotta tub mix and the tree blossomed! It flowered! Didn’t know these trees did that, awesome. Now, a third of the way through Summer, the tips are again brown. I was watering weekly, then changed to every two weeks sue to the browning tips, and now I haven’t watered in about three weeks. Half of the trees’ leaves have stayed green while the others turned red. After reading your replies to others here, I wonder if I should again repot it, yet tho time leave a third of the root system above the soil and cover it lightly with mulch. What do you think? Would this likely be too stressful for the plant? The other tree also took off this Spring after being reported. Yet there are some leaves/ branches with leaves which have browned/ dried out. Do the trunk test and leave it alone if still green? Most of this second tree is fine, although some misshapen leaves on the ends of new branch growth. Thanks very much for an opportunity to ask you about this. I love my plants and am learning how they talk so I can try to best serve them. Any help you are prepared to offer is very much appreciated. Thank-you. I’m not sure why you are keeping these trees in pots. If at all possible, they would be much happier in the ground. Trying to keep a tree like this happy in a pot is challenging. Planted in the ground they need little to no care at all, just a little pruning once or twice a year. In container you really only about one inch of the root system above grade but still covered with soil and mulch. I hope this helps. Hi, we got a japanese maple last year in a huge pot. I am currently planning a japanese garden so unfortunately the tree is still potted. I have looked at it and if it werent for leggy lateral growths on the lower half of the trunk i would think it were dead. I guess i need help in knowing if i can rescue it and if so what do i need to do. There is no magic to saving a Japanese maple. Best thing to do is get it in the ground, put it in an area that is not wet and at this point I wouldn’t fertilize it. A struggling Japanese maple can easily be killed with too much fertilizer. It sounds like you’re tree might be dead from the graft union up. This is how you test to see if a plant, or a branch on a plant has died. Just scratch the bark of your plants with your finger nail. If the tissue below the bark is green and firm your plants are fine. If the tissue is brown and mushy that part of the plant is dead. The dead leaves could be frost damage which isn’t great but the yellow flaky stuff sounds like some kind of fungal something or another. If the freeze got all of the leaves, that’s just not a good thing either. Hopefully these trees are guaranteed. They should be. Please help! My beautiful acer which has always looked so lovely in the summer since it was planted some 7 years ago etc has now, although has small buds on, in parts; I can break off the branches because they did not develop leaves and the branches are snapping and look dead inside and I think they are dead! The branches which seem to be dead are covered in a whitish bark. Can you tell me if I can do anything to make my acer recoverable? Thank you. This could be some left over winter damage from the past two previous winters. I’d trim out all the dead and just give the tree a chance to recoup. Many of my mature maples took a hard it over the past three winters and are still trying to recover. More than likely they will. 3 years ago we moved into a home (Ontario, Canada) that has a large and beautiful Japanese Maple in the back yard. It’s probably close to 15 years old. The last two summers I’ve noticed the leaves on the lower branches withering/curling and drying up. I thought it was just because it was a hot summer but the top branches seem fine. Could it be verticillium wilt? Probably not. Verticillium wilt usually attacks one complete branch. Just remove any failing branches, not much else you can do. I’ve done this and the trees recovered very nicely. This spring my Japanese maple had its usual pretty red leaves but none on several branches. These branches were brittle with no leaves so I cut them off.The stems where I cut developed cracks. Within several weeks parts of the trunk and along several thick branches I started to see long lines of bark cracks. The other day I saw a green metallic beetle at the end of one these long cracks. It looked like a flat head or emerald ash borer.. As it slowly moved I saw what looked like sawdust coming out of its mouth. I killed it (sorry I did not keep it as a specimen for identification the Any recommendations would be appreciated. The damage you described sounded to me like winter damage over the past two years. The beetle? I’m not sure. If the beetle is doing damage you should see boring holes. At least I think you would. ???? I have read about the problems encountered by japanese maple owners, but none seem to have my problem which is a whitish/yellowish very tiny wormlike critter that is attacking the leaves of my dwarf japanes maple. Consequently, the leaves on the outer edges are intact but those closer to the trunk are gone. The trunk itself seems okay. The leaves of the coreopsis planted nearby have developed some holes in their leaves. Any ideas? No ideas but you can spray for this worm I’m sure. My Japanese Maple has turned brown when I scrape the bark and has mold on the trunk and the branches. Leaves only grow on certain branches at this point and it looks to be splitting for the most of the branches.. Can this tree be saved or should I be looking to remove the train which is right in front of my house ? Any chemicals I can buy from local store to bring this tree back to life ? Thanks in advance for your help. Sounds to me like this tree is a gonner and for sure there are no chemicals you can use to bring it back. No matter what it says on the bottle. My japanese maple is dying . Many branches don’t have leaves. The branches & trunk are covered with a scaley green sustance (the substance is now also covering a closeby rhododendrum that is dying with many unleaved branches also. Japanese maples are pretty tough. The only thing that usually bothers them is severe winter damage which could be relevant from the two really bad winters that we’ve had. But they also hate being in wet soil as do rhododendrons. I suspect the soil in that area is too wet, maybe a downspout draining nearby. My Japenese maple has green colored bark. There are several branches that have turned brown and died. My Rhodi and Azeleas (in pots) have the same problem. Could they all be infected with a borer?and if so is there a treatment? If you have holes then I’d suspect borers for sure. Bayer should have a systemic product that will help. I doubt that the dog did any serious damage. I’m guessing the tree dried out in the heat. It could be over watering as well but that usually causes all the leaves to drop where a tree that got to dry just hangs on to dead leaves. Not much you can do other than water as needed but don’t over water and hope for the best. Check the soil and make sure it’s not soggy. It should be cool and moist, not soaking wet. My Japanese Maple has white tips on the end of the leaves. What is it and what do I need to do? Don’t be concerned and there’s nothing you need to do. More than likely those white tips are just the effect of summer winds drying out the tips of the leaves. I’m sure it will look great in the spring. My Japanese maple is a short one and about 7 years old. I’m in central CA, about 15 miles from the coast. Hot summers, cold winters. The past 2 years branches have been dying (not producing leaves) and today I went out and it was leaning forward (loose in the soil) and most of the leaves are curled and brown. I have no idea why. Please help! I don’t want to lose it (hope it’s not too late)! Thank you! Doesn’t sound good, sounds like it dried out. Your climate is a bit iffy for Japanese Maples. About all you can do is tamp it in, and water it well. But I don’t know, doesn’t sound good. Thank you, Mike. I just did both plus cut off dead branches and luckily there are live ones remaining (even though leaves are not). We’ll see. I also put some lavender mulch around the base. I appreciate your timely response. 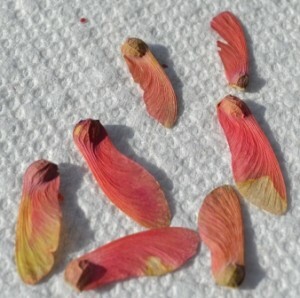 Some tip die back on Japanese maples is pretty common. In your situation I have a couple of concerns. Are the trees able to go dormant and stay that way for a month or two? They really need to rest. Secondly I’d think about the soil they are planted in. Japanese maples hate wet soil and even in poor soil that is a bit sticky they’ll survive but not thrive. Their roots need to breath and they can’t do that if the soil is hard and compacted. If you think that’s a concern wait until they are dormant and try raising them a few inches and mound the soil around them. And lastly, could they have been planted too deep? Ideally the top of the root ball should be at least one inch above grade at the time of planting. We have a HUGE Japanese maple that is 30 plus years old. Absolutely gorgeous every year. Until this one, we live in North GA and had a horrible drought last summer, no rain for three months. We kept this tree watered however. It is completely dead on one whole side but fine on the other. The limb that would have to be cut is probably 8″ to 9″ inches in diamater. Should we cut this huge limb completely off ? Scared to do the wrong thing, but no sign of life in it. Of course the prudent thing to do is probably to wait, give the limb a chance, but I don’t know that it will help. I’ve seen Japanese maples have fairly large limbs, just one part of the tree, up and die for no apparent reason. This is how you test to see if a plant, or a branch on a plant has died. Just scratch the bark of your plants with your finger nail. If the tissue below the bark is green and firm your plants are fine. If the tissue is brown and mushy that part of the plant is dead. I live in Atlanta Georgia and have a beautiful Japanese Maple in my back yard that is at least 25-30 years old. It is quite large and reaches the second story of my home. It is the centerpiece of my back yard. The leaves usually turn red the last week in October. This year I was wondering if they were going to turn at all – – they did not turn red untill December! But the leaves never fell from the tree this year. They stayed red over the winter (it was mild). It is now early April, the leaves are starting to turn purple green, but still the tree is full of leaves. Is this normal?? everything seems fine and the lights are not too tight. Could the lights have caused the leaves not to fall this year? The lights were timed to come on at 5:30 PM and went off at 2 AM each night. Or is there another possible cause? I really don’t know, I don’t think the lights have anything to do with this situation. Right now the tree should be putting on new leaves, new growth. If that’s happening I wouldn’t be concerned. If it’s not happening check the tree. This is how you test to see if a plant, or a branch on a plant has died. Just scratch the bark of your plants with your finger nail. If the tissue below the bark is green and firm your plants are fine. If the tissue is brown and mushy that part of the plant is dead. I just recently trans planted my Yellow bark. It was dormant and came out in early spring looking great. Last week I notice that the bark was turning black at the leaves were wilting. In less than a week it has spread though out the tree. Don’t know what is going on, but it looks like I’m going to lose the tree. My first thoughts are too wet or too deep. Not sure what else would cause this unless it’s delayed winter damage. ????? My tree is about 18 and has always been healthy. This spring it began to bloom but many branches are not.. The leaves look normal, no curling or brown areas. Already what look to be normal eaves are falling off from the areas that did bloom. Del, ?????? I don’t know that I have an answer. Possibly too wet all of a sudden for some reason??? My Japanese Maple is a beautiful tree with bright dark red leaves. I have noticed this spring that a lot of leaves are falling and many others are shriveling up. I have the past two years added a bird feeder hanging from a tree limb. We use feed with sunflower seeds. Is it possible that the seeds and bird waste be toxic to the tree? We have noticed that the ground cover under the tree has died. I really doubt that. I’ve heard this same thing several times this year and I’m at a loss. My Japanese Maple is 20 years old and has had no problems prior to this Spring 2017. There is severe leaf drop and white spots on the leaves.. This is also happening on a second Japanese Maple also 20 years old and planted in another quite different location. Can I treat for this problem? Not really anything I’d be concerned about. Could be just burn from frost or water droplets hitting the leaves on a sunny day. I wouldn’t know what to treat for. This happens and I’m not sure why, but once I figure it out I’ll do an article. I don’t think your other trees are at risk. I have this happen in the nursery and all of a sudden one tree out of a hundred in a group will fail. We have a yard full of Japanese Maples. All 30 years old and large. One in the center of the yard has just turned crispy brown on all the leaves uniformly. Looks like the who tree is suffering. Bark is coming off in chunks. It bloomed beautifully, and then suddenly all brown. I fear for all the rest of the gorgeous trees in my yard. Any ideas would be appreciated. I have a weeping Japanese maple about 10 years old. The last two summers it has come out normally with deep green leaves then the leaves start to turn orange and dry out. I have many stems that are completely bare. Tonight I was walking around it, raising the branches and checking for insects or disease. I found three small bags (about 1 inch long and 1/2 thick). They looked like miniature bag worms. When I gently squeezed them, I could see an insect inside. I immediately threw them on the ground and crushed them. I want to put something on my tree to protect it but I don’t want to use something that will possibly hurt bees and butterflies. What are these insects and what can I use to kill them? I honestly don’t know what they are but any insecticide is not good for other living things. I’d simply remove them and destroy them. We planted a miniature Japanese maple, last spring. It stayed with full leaves and did well, all summer and fall. This spring, the leaves came out, in full bloom and even had seeds. Shortly after, the leaves started drying up and falling off. Some new buds did form and leaves grew, but the foliage is very thin now. Is something common or can there be something wrong? It’s been planted, a little over a year now. It’s about 6″ tall now and supposed to reach a height of 10 to 12: when fully mature. This could be an issue of verticulum wilt and I don’t know that there is anything you can do about it. As long as the tree is still alive I’d have hope and next spring it could be awesome. Not so sure I believe that having watered hundreds and hundreds of Japanese maples from overhead. By the end of summer they do have water spots on the leaves. Under drip, root watering only, I’m sure they would look very different. Hi, I have a very small, new japanese maple that has this powdery white substance on its leaves, that can be easily wiped off with my finger. It hasn’t really been making any new leaves, and the leaves it has don’t look so good-somewhat discolored and some are shriveling. Is it powdery mildew? It’s potted, if that’s relevant. It is powdery mildew and you can actually spray it with milk. Pretty common, fairly harmless. Probably has little to do with being in a pot, it’s humidity related. My Japanese maple got attacked by gypsy moth cattipillers and has not sprouted any new leaves will it recover . Pat, if it’s alive it will. This is how you test to see if a plant, or a branch on a plant has died. Just scratch the bark of your plants with your finger nail. If the tissue below the bark is green and firm your plants are fine. If the tissue is brown and mushy that part of the plant is dead. My Japanese Maple leaves did not fall off this Fall. This has never happened before. The leaves turned brown and look dead but are still attached. Do I have a problem???? That’s a good question. I think not, but I’ve been hearing this from across the country and mine here in Ohio are the same as yours this year. Sounds like some kind of scale insect. Could be the result of unhealthy wood on the plant. My fireglow japanese maple has a few mossy spots on it and now is splitting at the base… It is May in upstate Ny and it is still not budding granted we had a long winter. It is roughly 3-5 yrs old and wad beautiful and full last year. Any ideas on what to do? I purchased a very young Japanese Maple in honor of my foster parent who had one that was beautiful. He saved my life so this was a tribute. I put in in the ground in a pot because it is too cold here in winter. Now it has brown spots on most leaves. This morning I took it out of the soil and placed it where it will not get so much water. Any advice? Also, please do n0pt worry about grammar. The plants do not care, and neither should the people who find your Website so helpful. The brown spots are probably just from frost, don’t be concerned. It will make new leaves. Don’t fertilize it. I have 8 Japanese maples all seem ok except 2 have damage to the trunk. The bark is cracking and coming off. I lost an apple tree and a cherry tree to seemingly the same problem. I don’t see any sawdust, beetles(or evidence of them). Any help would be great. I’m afraid I’m going to lose them too. Not a lot you can do but trim off any lose bark, remove any ragged edges so water runs off easily. If the trees are not completely girdled they may recover nicely. Not sure what caused it, I had this happen once after a really hard winter. My Japanese maple, which has always been beautiful, did not drop all its brown withered leaves last fall. Now it is June and only the two sides which had dropped its leaves have new beautiful red Lacey leaves. The other two sides, front and back, which had the leaves stay attached all winter, have NO new leaves, completely bare. Looks like buds but never budded into leaves. These branches are brown and hard when scratched, not green. Should I prune these two sides back and hope the tree fills in?? Thanks! My Japanese maple is about ten yrs. old and has always been full and beautiful. This past fall, all of its leaves did not fall off. Wherever they stayed throughout the wi tear into spring, no new leaves have sprouted. There are leaves on only two sides of my tree. Other sides are bare limbs. Looks like these have dried buds on them. When I scrape these no leaf branches, there is no green, just white but not mushy either. Do I completely prune tow whole sides of the tree? That will look terrible. Or do I replaces the tree? Make sure those branches are dead. If dead remove them. The tree will not look good, but more than likely it will fill in in time. But it will take a couple of years. This is how you test to see if a plant, or a branch on a plant has died. Just scratch the bark of your plants with your finger nail. If the tissue below the bark is green and firm your plants are fine. If the tissue is brown and mushy that part of the plant is dead. My mature Japanese maple seems to be growing backward. The leaves on the higher branches are gone yet there is a plethora of them growing on the thicker branches near the ground. I’m talking about branches 8 inches around, while the smaller branch shooting off that seems to be dying. It looks like the grafted part of your tree has died and the growth you see is coming from the rootstock, below the graft union. Chances are it’s not as pretty as what the tree was originally. One of four things. Too wet, planted too deep, too dry, but that would brown leaves not necessarily dropping or too much fertilizer but that too should create brown crispy leaves. So that leaves one and two. My 20 year old Bloodgood put out smaller leaves this year and fewer of them. We usually can’t see through this tree and now we can see the sky through it. I don’t see any dead limbs or brown leaves. I do see plenty of seeds, as usual. Is there anything we should be doing? Nancy, nothing that I can think of. Make sure extra water isn’t gathering near the tree. I havea bloodgood maple some of the leaves look like spider webs what is it ? I really can’t say for sure, if they are just webs I’d just remove them. If something is damaging the leaves you might have to spray. We Japanese maple which has a rubber like compound surrounding the truck. More mushroom like, I would say. Sounds like it dried out in the dead of summer. We had large trees do that this summer. Usually they don’t need a lot of extra water. Should be okay come spring. So apparently I’ve been watering both the leaves and the root at least every other evening so it must have caused the leaves to burned out.This entire time I thought it was under water so I tried to water it daily until I read your article above, so thank you for the info! Anyway, is there anything I need to do to save those leaves other than stop watering them directly? At this point I’d just give it time. Don’t water at all until summer. And even then, maybe once a week. This was a excellent informative post you have shared on this page about tree in a Pot but If your neighbors have a productive fig tree, see if they will give you a few cuttings. A tree that is already thriving in your climate is a better choice than a tree growing in a nursery far away. Possible winter damage from a few years ago but in your zone probably not. Not really sure what would cause this. Most likely it’s the weather we have been having here in GA. Not enough water in the winter and not a hard winter seems to weaken the tree and then summer with it’s blistering heat and high humidity exasperates it.